Alle relevanten Funktionen im kompakten Design. Längenmessung, Flächenermittlung, Volumenberechnung - alles intuitiv bedienbar. Beleuchtetes, dreizeiliges Display für beste Lesbarkeit. Speicher-Funktion ermöglicht einen einfachen Zugang zu letzten zehn Messungen. Robustes, stoßfestes Gehäuse mit Schutzklasse IP54 (Spritzwasser- und Staubschutz). Zuverlässige Mess-Ergebnisse unter allen Umständen erwiesen durch ISO-Zertifizierung. Messgenauigkeit: ± 1,5 mm, 635 nm, < 1 mW, Klasse: 2; Stromversorgung: 2 x 1,5-V-LR03 (AAA), Staub- & Spritzwassergeschützt nach IP 54, Gewicht: 90 g, Maße: 41x24x105 mm. 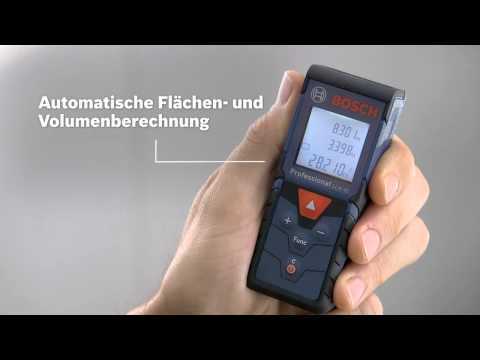 Bosch Laser-Entfernungsmesser GLM 40 Professional wurde bewertet mit 4.6 von 5 von 19. Rated 5 von 5 von NK55 aus Bosch rangefinder Recently purchased this from Screwfix, have considered buying one for a long time and finally bit the bullet, have to say I am suitably impressed, the accuracy is the one thing that I doubted would be perfect but I am proven wrong, have checked and verified it against a good quality tape measure and it comes out right every time, does take a bit of getting used to it's functions but it is very intuitive and easy to use, have only really started using it but wish I had bought one years ago, it saves considerable time when doing measure ups on site, have only rated 2 stars for reliability as only just purchased Would recommend !!!! Rated 4 von 5 von flamingjo aus Does What It Says! Small compact and with all of the features that you'd need from such a device. Rated 5 von 5 von Sam19 aus Handy Product to have! This is a great gadget to have at work / home. it takes 2 seconds to measure a room, easy to use and get the hang of. It is also very accurate. Rated 5 von 5 von vonFurstenburg aus Measures up... A great bit of kit. Have been thinking about buying one for a while. Decided to bite the bullet. One of those 'how did I do without it before' products. There is an understandable uncertainty about non physical measuring as opposed to physical (read, tape measure) but test it over a predictable measured distance and... go from there. This has simplified and speeded up virtually all measuring over 3 or 4m that I ever do. Single handed and quick. Time is money. A great product.